A very familiar face to many of the Valley’s up and coming artists, Linda Bradshaw is probably best known as the art teacher at Hopewell Elementary School for the past 26 years. As a regular exhibitor in the Garden State Watercolor shows, Bradshaw’s paintings portray many iconic scenes in Hopewell Valley – downtown Pennington, local landscapes and familiar barns – and her watercolors masterfully capture the play of light and shadow and the special drama that is created. 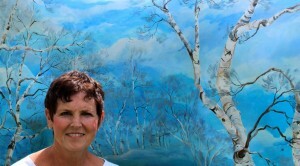 Bradshaw received a bachelor’s degree in art education from Adelphi University and began a serious study of watercolor painting techniques in the mid-1980’s. She works primarily “en plein air” and has shown in Artworks, Artists of Yardley, Prallsville Mill and Phillips Mill, and the Veridian Gallery in Pennington. Recently retired, Bradshaw and her husband Eric spend split their time between Pennington and Quechee, Vermont.